With the installation of the green roof on Lang Performing Arts Center (our fifth green roof), we experimented with a new way of planting the vegetation: sowing seeds. A year after the install, we are enjoying the initial success of this seed germination. 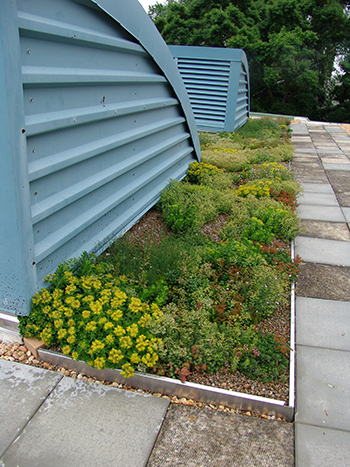 As with our past roofs, we planted sedum and other green roof plants with small plugs and by spreading cuttings. The install was completed by applying a slurry of seed. The seed mixture was combined with pourable fiber mulch and water. 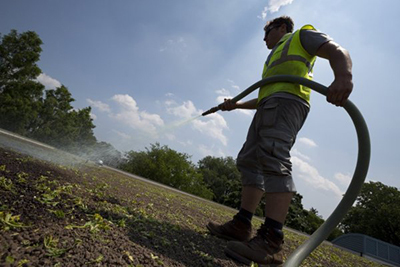 This slurry of seed was applied with a hydro-spraying machine, similar to using a broadcast spreader to apply seed to your lawn. 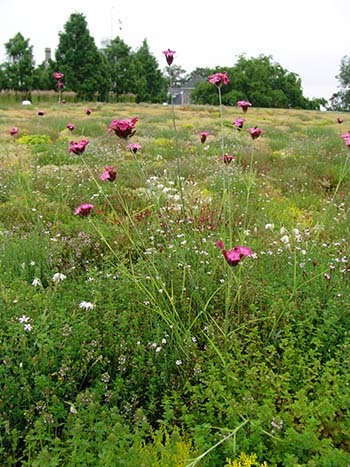 Sowing seeds is an effective and economic way to vegetate a green roof, but different seeds require different germination conditions. Thus various seed varieties will germinate throughout the growing season. 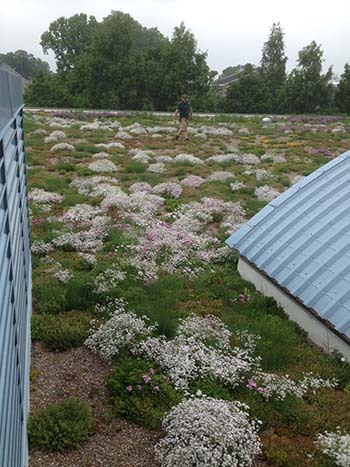 We are enjoying some wonderful blooms a year after the install or planting of the roof. The most captivating this spring was the bloom of Gypsophila repens, creeping baby’s breath. As implied by the common name, this baby’s breath on reaches 15 cm in height. The diminutive white flowers created a carpet of white on the roof. Another surprise delight from our seed mixture was Dianthus carthusianorum, Carthusian pink. This Dianthus was named in honor of the Carthusian order of monks in the Chartreuse Valley in the French Alps. As an alpine plant, D. carthusianorum is ideal for growing in the harsh conditions on a roof top. 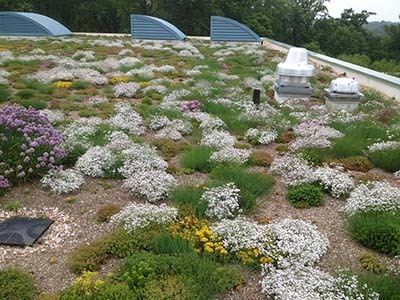 The brilliant pink blooms add pops of color to the green roof. 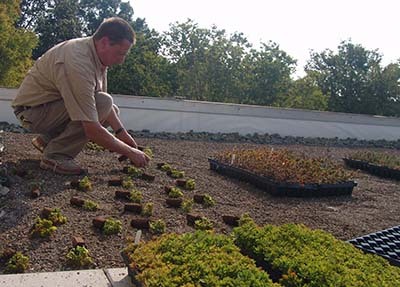 Experience the green roofs for yourself on our guided tour on Tuesday, September 16 from 5 to 6:30 pm.